I was very sorry to learn of the passing of author T.M. Wright yesterday. I knew him best for his 1984 novel, A Manhattan Ghost Story. It’s a weird, trippy book which shuttles back and forth between a past in which two boys are breaking into a mausoleum and a present in which a man is losing track of the difference between the worlds of the living and the dead. Its style is low-key, conversational, its evocation of Manhattan vivid. In its experimentation with narrative convention, it strikes me as akin to Peter Straub and Tom Tessier’s fiction (not to mention, as a kind of thematic ancestor of Paul Tremblay’s recent A Head Full of Ghosts). It’s another one of those books that demonstrates how much a talented and ambitious writer can do with the material of horror; if you haven’t read it, I recommend it. 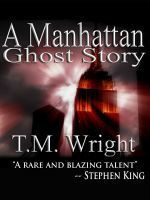 Nor was A Manhattan Ghost Story Wright’s only book: his output of novels and stories was impressive. From what I understand, Wright had been ill for some time. May he rest in peace.